Vapiano Wardour Street The Italian Restaurant with its unique split the bill idea! So many entrees to choose from! Ridiculously easy to split the bill! Fancy a taste of Italy in London that’s quick and easy and a little bit different? Look no further than Vapiano Italian. Vapiano serves authentic Italian food such as antipasto, pasta and home cooked pizza. Order directly from the chef and watch your food be cooked exactly to your liking. 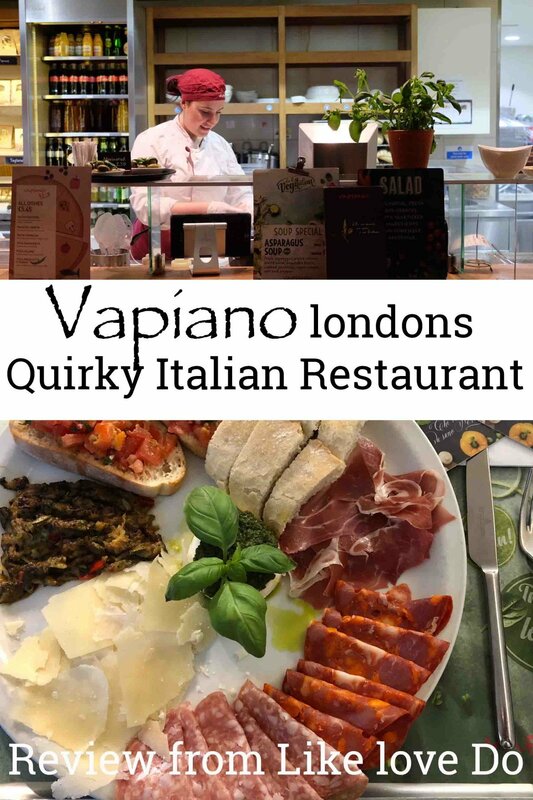 The concept and focus of Vapiano is unique and the idea of fresh ingredients cooked as you watch is exciting in an Italian restaurant. This idea was originally from Hamburg and now spans across 33 country’s with 6 being in the UK. We were delighted to visit the Wardour street branch of Vapiano in Soho recently. It was somewhere I had walked past many a time but had not tried, I have to say we were pleasantly surprised. Vapiano is a self service restaurant so you will have to go up and order your food and watch it be prepared. Having said that it so lively and the staff are so friendly we found this a pleasure. The unique thing about Vapiano is the self service and the smart card. There will be no more awkward splitting the bill at the end of the evening or wondering if you ordered more drink than your friend. When you arrive at Vapiano you will be given your own smart card to charge your meal and drinks to. Take your pick of starters, mains or desserts and pay your bills individually at the end. Vapiano is a bustling busy restaurant with real good handmade Italian cuisine. I was amazed at the variety on offer when I visited the Wardour street branch in London. A bustling and lively restaurant with a combination of seating such as tables with high stools and and downstairs lower tables and stools. Pick your spot and grab a menu first because as there is so much to choose from it may take a while. When you are ready the idea is to order your food from one of the open bar service areas. Your food will be made to order and when finished all you have to do it pop your smart card on the reader to log your choice. We ordered a bottle of wine and bottle of sparkling water but I must say I was looking through the cocktail menu also. with an awesome range of cocktails it will make for a great start to a night out. I was pleasantly surprised by the range of antipasti in the restaurant also, the choice is extensive. Mouthwatering bruschetta or finely sliced carpaccio were on the menu. We must of deliberated for a good 20 minutes over a glass of wine on our choice of starter and eventually opted for the sharing platter. So I whisked away my menu with my Vapiano smart card to be greeted by a lovely lady behind the Antipasto bar where I ordered Piatto Antipasti at £12.99. After being instructed how to pay by popping my card on the electronic pad I watched the preparation. I was amazed by just how huge this platter really was generous slices of cold meats, bread cheese and roasted veg adorned a huge platter. It was most definitely large! I took our antipasti back to our table where we devoured the lot! However we were then left wondering if we had room for anymore! The main choices took some time to decide as well with over 16 types of pizza and 24 types of pasta and risotto. We finally decided for the Cognac which had been recommended. This pasta dish was an excellent choice dressed with chicken, bacon, peas, and a creamy cognac sauce. We even asked for some fresh chilliest to be added for a kick. Not only did we have to choose which pasta we wanted but also the type! 11 different pasta shapes including 2 spelt pastas are made fresh everyday in Vapiano. Their pasta is also suitable for vegans as it is egg free. We shared our genourous portion of the smooth sweet and spicy cognac with another glass of wine whilst we perused the Pizzas. Alas I was struggling to move as I had eaten so much, it was just too good to leave on the plate! So we decided that we would be good and opt for a coffee instead. Having missed out on the pizza which is made in front of your eyes from scratch I popped over to have a look. The chefs were so lovely and chatty it was really lovely to watch. They all told me I needed to try a pizza! I was recommended the Gamberetti e rucola with king prawns, rocket, olives and fresh mozzarella. The the ingredients were so fresh and authentic and very generous. Every plate of Italian culinary I saw being made looked mouthwatering and a generous size. The quality of the ingredients is the focus for Vapiano and being cooked to order it will be exactly how you like it. You can always add extra if you wish such as chicken, prawns, extra cheese for a small extra charge. Backing away from the pizza with a friendly wave from the chefs I wandered past the desserts! Everyone has room for dessert right? Well I was certainly going to try some and somehow I just had to order two! A panna cotta which is a blend of vanilla cream topped with strawberry sauce and a cioccolata which is white chocolate, salted Caramel a biscuit base. They were both delicious and went down well with my coffee. As I said before the portion size in Vapiano was very generous so for children there is a kids menu. For just £5.45 your pint sized kiddies can order pizza or pasta such as pasta pomodoro, or bolognaise. The kiddies can even order themselves. Paying is super easy too, hand over your separate cards for your bill and then pay individually. The buzz of the place makes it perfect for groups of friends or families with children. It’s also perfect for teens popping in with their friends as they can pay separately. 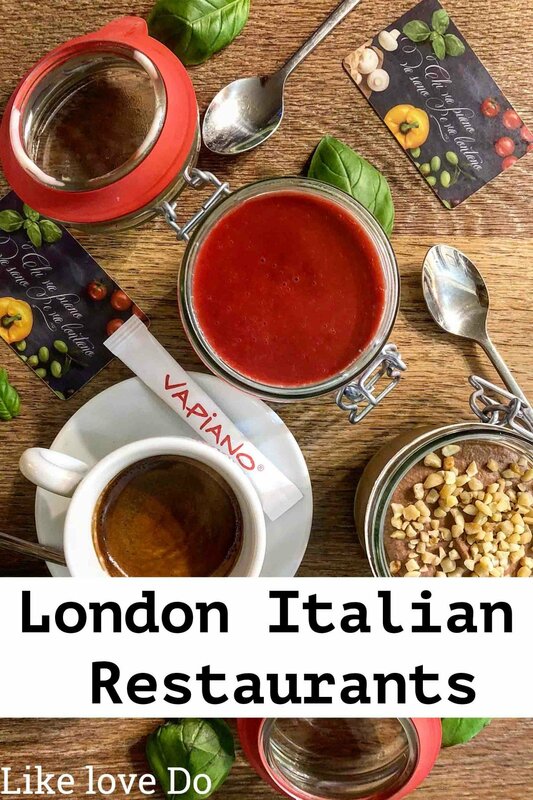 The current Vapiano London restaurants are Wardour street Soho, Bankside and and Portland street. There are another two in Scotland, and one in Manchester so you will be sure to find one on your travels. There are also three more addresses opening in London over the next few months so keep your eyes peeled! I will definitely be trying a Vapiano Italian restaurant again soon as the menu was so vast! The food was delicious and the concept was so easy and convenient.